This post has been created to show you a series of examples of how a NAO humanoid robot and its programming software, ‘Choréographe’, can be used to teach elements of the new Digital Technologies curriculum at each level. Follow, describe and represent a sequence of steps and decisions (algorithms) needed to solve simple problems (ACTDIP004). Students could program a NAO robot to introduce itself to their class. Students could program the following sequence using the drag-and-drop interface in ‘Choréographe’ and then have the robot perform the sequence. Above: Drag-and-drop programming with NAO’s software ‘Choréograpghe’ which features a virtual robot that allows students to test their programs without a physical robot. Choréographe can also use ‘Python' code. Define simple problems, and describe and follow a sequence of steps and decisions (algorithms) needed to solve them [ACTDIP010]. Jane needs to find out the favourite colours of her fellow students. Jane can program NAO in the following way to survey her class. NAO will first ask: “what is your favorite colour”? Then a speech recognition box is activated. If the robot hears “Red” it will respond, “Me too”! If the robot hears "Blue", it will reply, “I don’t mind Blue” and if the robot hears "Yellow", it will respond “Eww I don’t like Yellow very much”. Jane can create a table to record the results of her survey. Design, modify and follow simple algorithms represented diagrammatically and in English involving sequences of steps, branching, and iteration (repetition) [ACTDIP019]. Susan has designed a math quiz game using a NAO robot. Susan has programmed the robot to ask a series of Math questions and then listen for answers. When the robot hears a correct answer it will take a step forward and when it hears an incorrect answer it will take a step backwards. Correct answers will prompt the robot to move onto a new question whereas incorrect answers will prompt the robot to repeat a question. This exercise covers sequencing, branching, and iteration (repetition). Design algorithms represented diagrammatically and in English; and trace algorithms to predict output for a given input and to identify errors [ACTDIP029]. 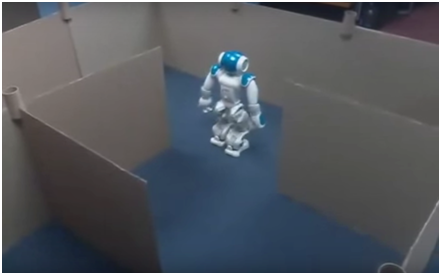 Students can design an algorithm to solve a maze using a NAO robot. Provided that the maze is ‘simply connected’ – meaning that all of the walls are connected together or to the boundary of the maze - the ‘right-hand-rule’ can be used to solve the maze. Once the student has designed their algorithm they can upload it to a NAO robot and place the robot within a maze for testing. Design algorithms represented diagrammatically and in structured English and validate algorithms and programs through tracing and test cases [ACTDIP040]. Students can design an algorithm to take coffee orders. If the respondent answers ‘no’, the robot will respond, ‘okay thank you for your order’. If the respondent answers ‘yes’, the robot then asks, ‘how many sugars would you like?’ then the robot will say, ‘okay thank you for your order’.